As well as the activities outlined below March 18th. to the 28th. saw us visiting four significant locations in western Europe, specifically the site of the great medieval park of the Counts D'Artois at Hesdin in northern France, the eighteenth-century water gardens at Annevoie-Rouillon in Belgium, the Chateau de Modave also in Belgium and finally the site of the famous Hortus Palatinus in Heidelberg. You can read about the trip and the gardens here. Peter completes cleaning down one side of the ramp... and here's the fill half removed with a partial section across the middle. The upper portion of the chute seems to have been hit with a sledge hammer as part of its demolition and Peter explores a charcoal layer to the south beyond the oil pipe. And here's the feature cleaned out and cleaned up: view looking east and view looking south into south west corner. What is this feature? I'm still pretty convinced it has to be associated with water but there is no plug hole to drain it so water must have been pumped out. Why the peculiar configuration? 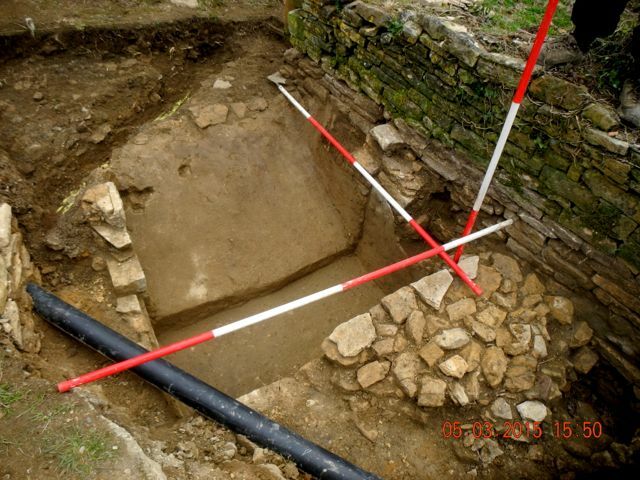 Was the sloping side acting as a catchment area to channel water into the cistern? If so why? Enstone is not short of water. Actually, I've just thought of one possible reason for collecting rainwater - as it bubbles up out of the ground water hereabouts is very hard indeed -full of calcium salts which would fur things up pretty quickly, especially the inner workings of some delicate little fountain. Could this be why Bushell brought the water for his fountains in from nearly 3 km. away when there was plenty bubbling up out of the ground? Yes I know he needed a good head of water to get sufficient pressure for his fountains but it could be part of it. Or maybe it is an ornamental feature or functional in some kind of industrial or agricultural way? 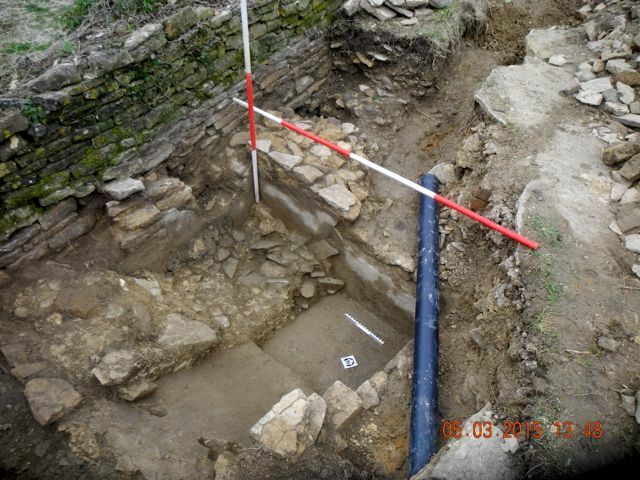 We wondered if it was an elaborate cess pit but if that were the case it had been polished clean before being filled in! Any further ideas or suggestions gratefully received - someone must have seen something like this before. 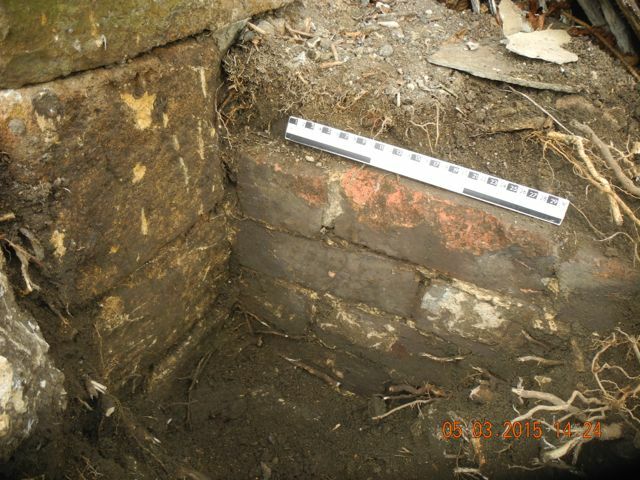 This is the building material that came out of the fill of the cistern and here is more interesting stonework and brickwork on the edge of the site where a new fence is going up. Back at Hanwell the low lake level continued to facilitate our examination of the lake side wall. 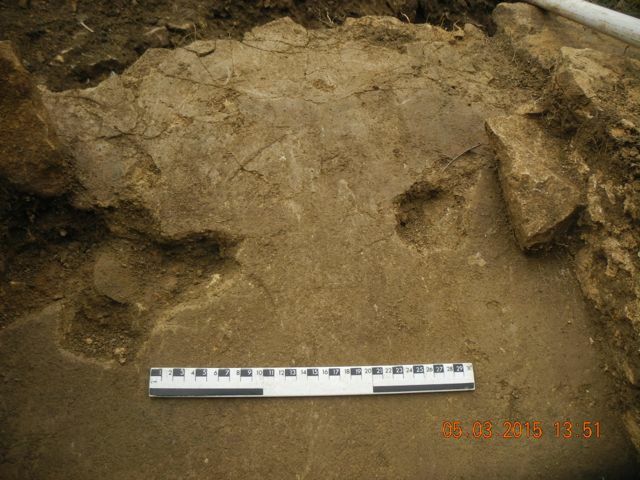 We marked out a 5 metre stretch to examine adjacent to the small section dug last month. 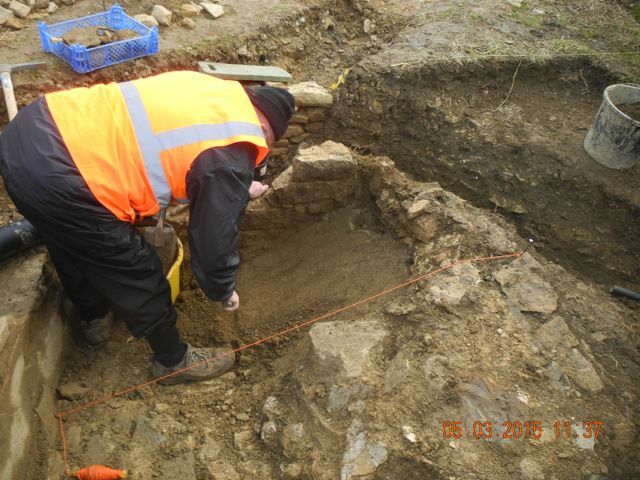 Initially work concentrated on archaeological weeding then clearing topsoil from amongst the rubble. 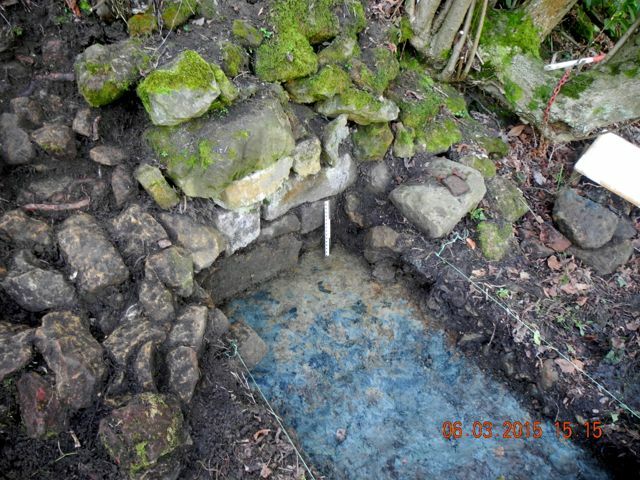 On the section itself we discovered that the lower course of walling is founded on the blue clay! Something of surprise. It's certainly true that this wall is no where near the quality of the terrace walling even allowing for a degree of erosion. A key find amongst the collapsed rubble of the wall were several fragments of a salt glaze stoneware bottle often known as a Bellarmine. Peter and Mike hit the rubble and yes the clay really is that blue, I had to use the GLEY2 page of my Munsell Soil Colour Charts for the first time. 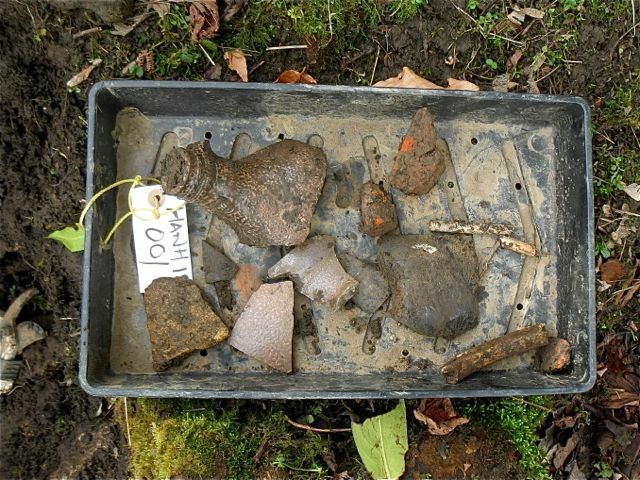 Mike holds up his Bellarmine, there are several more fragments in the finds tray. 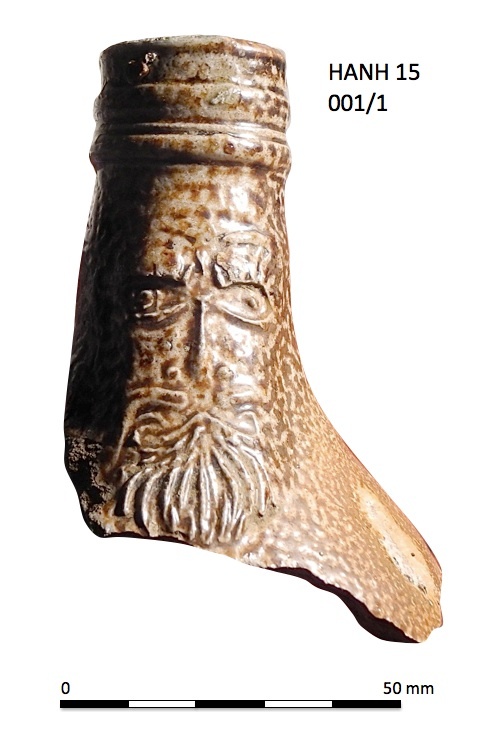 Bartmann jugs (from the German for 'bearded man') are an interesting phenomenon of early modern ceramics. Made primarily in the Rhineland in the sixteenth and seventeenth centuries they were used to export Rhenish red wine in large quantities. They are a salt glazed stoneware and what everyone remembers about them are the curious bearded mask like faces which adorn the neck of the jug. 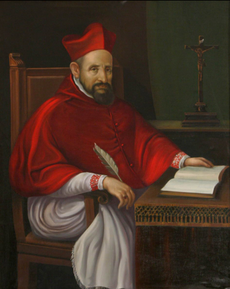 The jugs were sometimes named after cardinal Robert Bellarmine (1542 - 1621) famously one of the early prosecutors of Galileo. The chances are overwhelmingly that this is a German import however, there is an outside possibility that this could be a fragment of an English made vessel. If so a whole chain of curious coincidences come into view. the first manufacturer of this kind of pottery in England was one John Dwight who set up his pottery in Fulham in 1672. Prior to that he had been at Christ Church, Oxford, probably in the early 1650s, where he had studied Chemistry and worked with both Hooke and Boyle who supported him thereafter. He was also eulogized by Plot in his Natural History of Oxford who describes in some detail his ingenuity in producing a range of innovative products. As far as the bottles are concerned these were only really produced between 1675 and 1676 when of course Plot was busy compiling his book and Sir Anthony was busy dying. (Chris Green 1999. John Dwight's Fulham Pottery - Excavations 1971 - 79 English Heritage ). All very intriguing. Not to be outshone a few minutes later Peter pulled out of the mud what looked like a half full bottle of gin with the top intact. 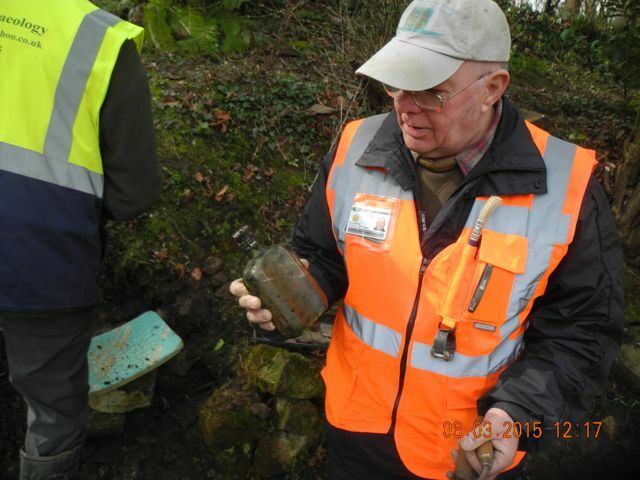 Unfortunately it turned out to be an old Hennessey Cognac bottle with a crack in it - half full of pond water - not a particular pleasant tipple. Nice try Peter. 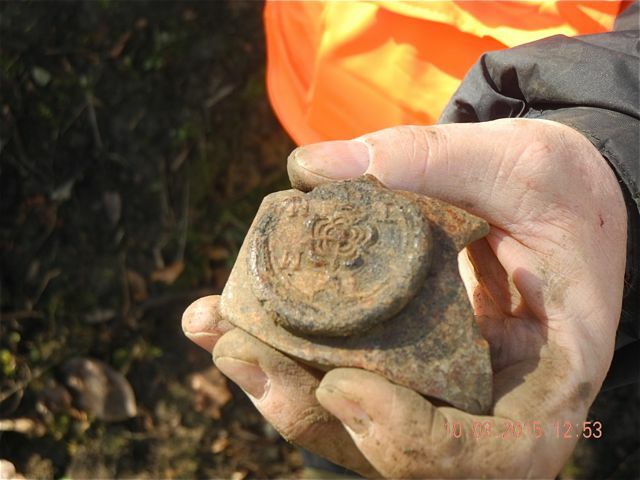 However, further work the following week gave Peter the chance to discover a rather intriguing fragment of seventeenth-century wine bottle with attached seal. This shows a Tudor rose surmounted by a bird within four initials. Unfortunately the top left one has flaked away so we have '? M' and underneath 'T M'. Any suggestions as to possible identification will be gratefully received. Peter contemplates taking a swig and the following week mourns the passing of a fine drop of wine. 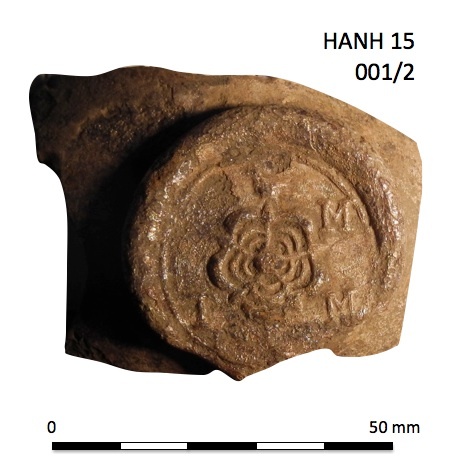 The wine bottle seal, clean and close up. 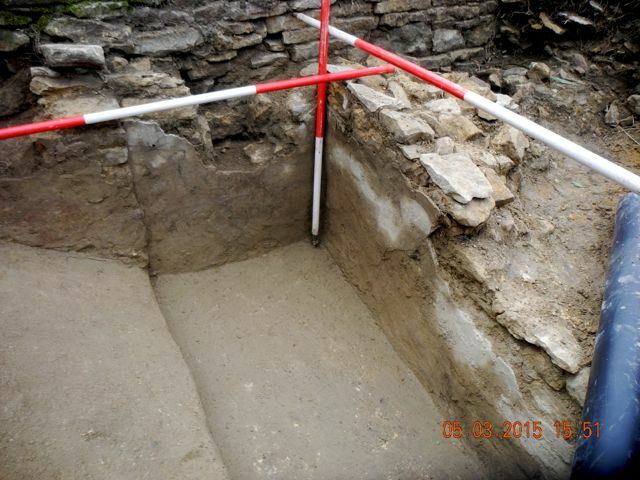 After another day's excavation we can see the full extent of the tumbled rubble from the wall. 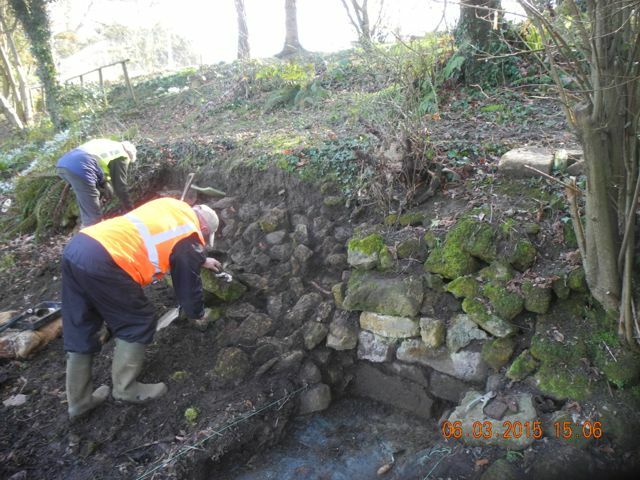 Whilst our European trip was underway Peter and Mike continued to work on the lake side wall . 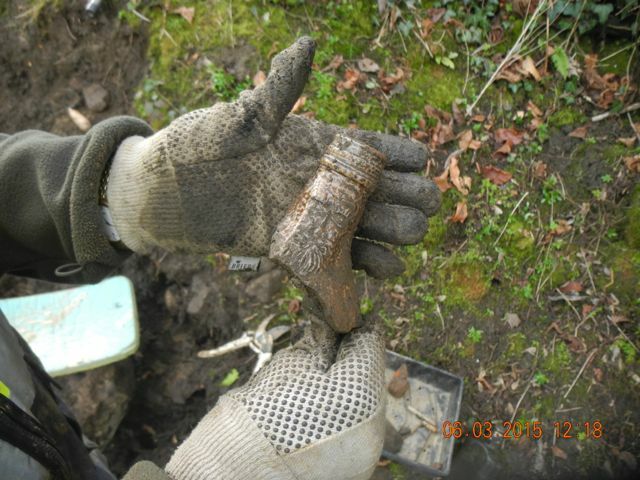 Peter reported thus: "We cleared the collapsed rubble from an approximately 2 metre length down to the 'blue clay' in doing so we retrieved (from the rubble) a few sherds of bottle glass, unglazed tile, a pipe stem, a part red brick and another bottle applied seal very faint lettering. Finds from the lower surface (Top of blue clay) glass, glazed ceramics. 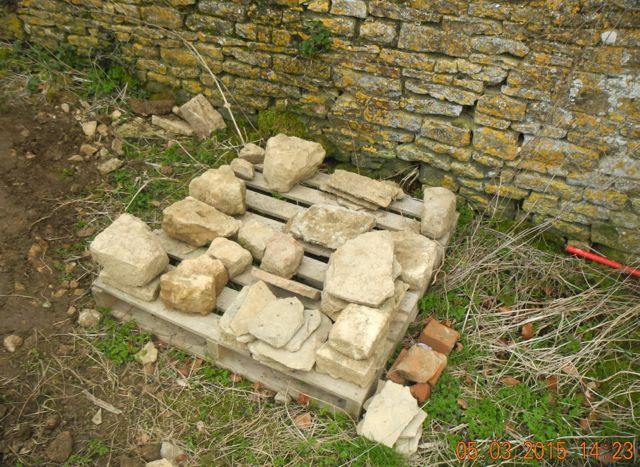 A number of good pieces of worked stone recovered during the day, displaying gutters, drips, chamfers, rebates and semi-circular moulding, were part cleaned and placed onto the small board next to the spoil-heap." ... and meanwhile other interesting bits of carved stone were turning up in Hanwell, the Banbury Guardian on March 25th. 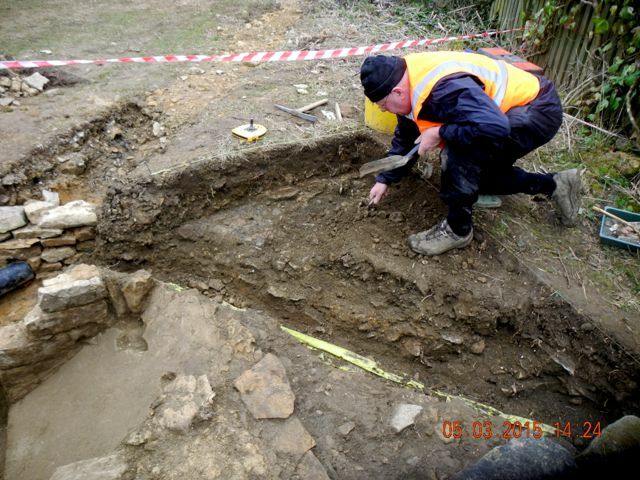 reported thus: "More clues to Hanwell’s Tudor history were revealed at the weekend when two residents discovered carved stones while clearing out the village well, which runs through a trough in the village centre and out into Hanwell brook. 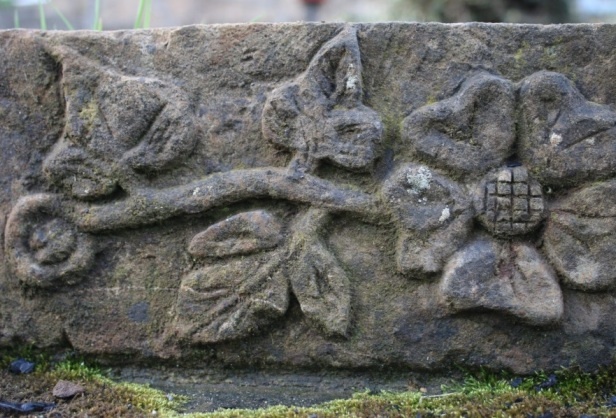 Peter Gordon and Giles Dessain were freeing up the water flow when they noticed the carvings – depicting Tudor roses familiar to carvings recently discovered with a large, stone Tudor coat of arms during renovation of a period cottage nearby. "Hopefully we can get a peek at the thing quite soon. Well, what to make of this? As a piece of carving its really quite basic, not the quality of work we've seen so far associated with the castle. 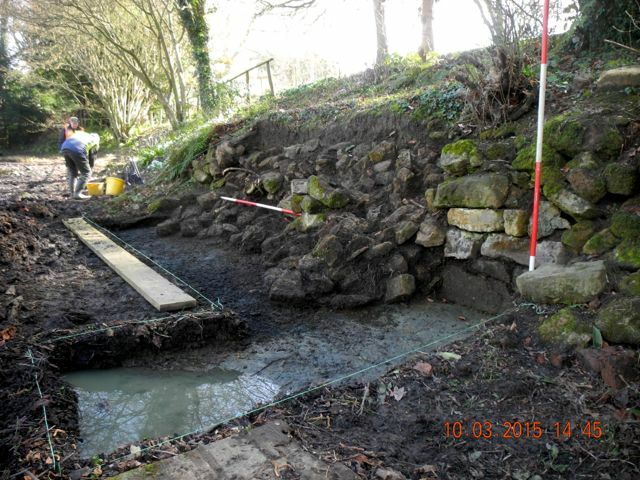 By the end of the month, thanks to those sterling efforts from Peter and Mike, we had completed the excavation of our 5 metre stretch of lake side wall. 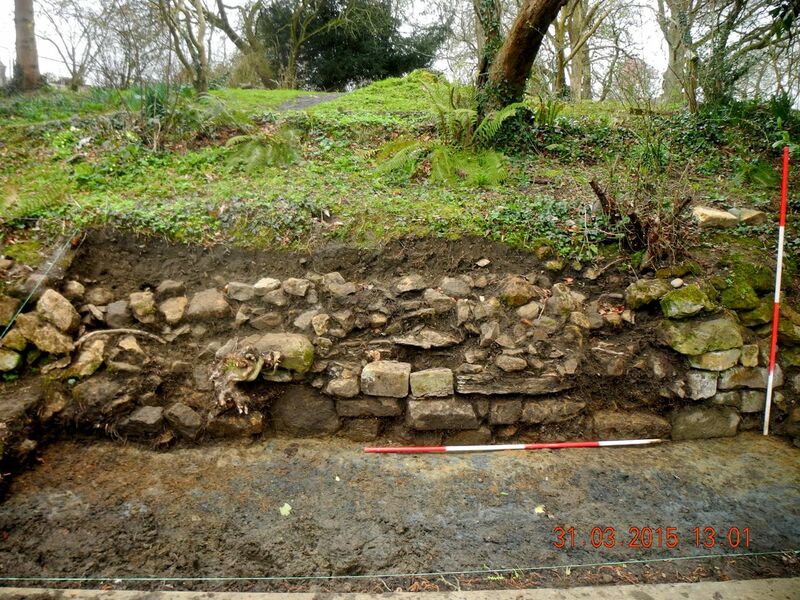 It has to be said that the quality of walling, even allowing for a fair amount of erosion is not good. Interestingly and extensive search along the far side of the lake failed to reveal any trace of a comparable wall so the view towards the castle would perhaps seem rather more formal and the view away a touch more natural perhaps? 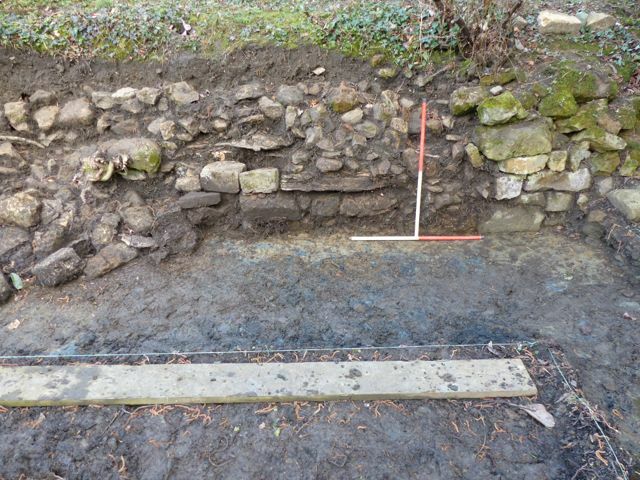 The whole 5 metres after all the tumbled rubble had been excavated, south side of the lake view looking south. Now it's time for some restoration.